This photograph is of my father (William) and his mother (Evelyn) taken about 1940. My father was the first child and was born with club feet. His parents were told that this would affect him all his life and that he would never be able to play sports. He was given a new treatment at that time and spent most of his younger years in plaster casts. He also got meningitis as a toddler and spent many months in hospital recovering. William was to prove the doctors wrong as is wasn't long before he developed a love a many different sports, spending all of his spare time as a child and young man playing football, rugby, rowing & cricket. Now in his 70's, my dad still enjoys an active life, now enjoying his time with golf and swimming. If it wasn't for the love, nurturing, strength and support of his mother during those important early years, things might have been very different. I was blessed with having both parents being brought up by wonderful mothers and so life continues down the generations and my mother taught me through example to love and support your children unconditionally. For me, being a mother has been the greatest experience and joy of my life, so loving my children (and grandchildren) unconditionally is so easy. When I began writing this I was thinking that although I agree that a mothers love has no end, as not even death ends the love, it begins with becoming a mother the first time. 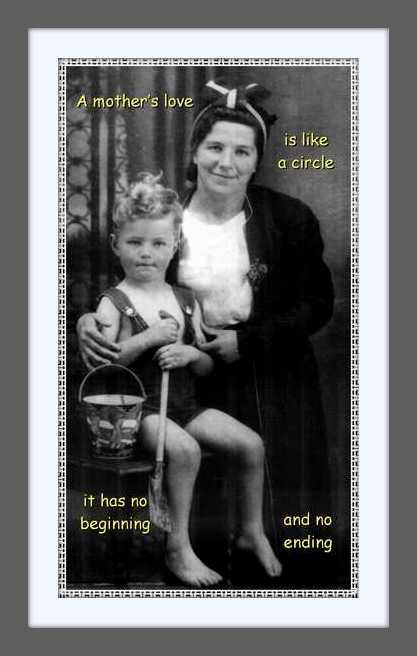 But now though, I am thinking that there is no 'beginning' because (as long as you are blessed with a loving mother, whether natural or adopted etc..) the motherly love goes back (and forward) through the generations. I am going through all of my earlier blog entries to check and update them as they are all continuing to be viewed. I will not change my earlier writings, I am just checking for errors and adding more to each in some way or other. My father, now in his 80's, is still leading an active life, although he has given up playing golf, he still swims 50 lengths of his local pool three times a week. I wrote the following poem for my mum to give her on Mother's Day 2015.